It’s funny how at one time, the Tea Party movement was aligned with Occupy Wall Street in protesting the big banks, trillion dollar bail-outs, and corporate greed and illegality. Now, they have moved their sights to the next most wealthy, powerful, and politically nefarious cabal in the world: Mosques! So here we are in 2015 with anti-Muslim rallies happening outside mosques around the US. Obviously, this is a bad thing as these protesters are driven by hate and fear. But, the silver lining is that we can take this as a sign and try to see the positive. 1. Those who don’t know anything about Islam or have a distorted view of Islam and still hate Muslims. 2. Those who do have a basic and accurate understanding of Islam and its teachings yet still hate Muslims. As for the first group, what better way to learn about Islam and correct misunderstandings then going to a masjid! Sure, they won’t necessarily be going inside, but at least it’s one step closer and they can see Muslims coming in and out of the mosque — that visibility, at the very least, can be beneficial. As for the second group, you have to wonder what motivates someone to hate the followers of a religion so much to want to go protest. I can understand why Christians may be religiously opposed to Islam and Muslims, but wouldn’t they want to invite Muslims to become Christians or try to be neighborly towards that end? 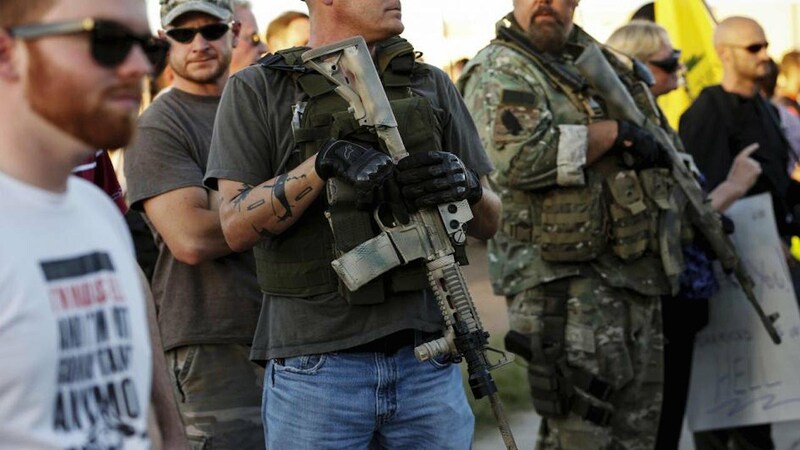 Angrily rallying with brandished guns doesn’t seem like a very Christian thing to do. Or maybe a lot of these protesters are atheists or the non-religious, in which case, these protests also don’t seem to be in line with humanist principles. So, either this second group just consists of confused people or people that are just purely hateful. But that’s also a positive because there is no better sign that one is on the truth and in the right than the fact that confused, hateful people are frothing at the mouth to oppose you, not with conversation or debate but with bullying. However you slice it, there is good to be found even in something as stupid, pointless, and disturbing as these anti-Muslim rallies.